During Holy Week we took part in the proclamation of the passion accounts on Palm Sunday and again on Good Friday. We joined in the choosing of Barabbas over Jesus and we spoke those terrible words “crucify Him!” Now we are invited to speak the words of doubting Thomas: “My Lord and my God!” The shift from rejection and condemnation to faith and trust is purposeful – for in these words we glimpse the heart of the transformation demanded by the mystery of the death and resurrection of Jesus. In the passage from the Gospel of John, several key encounters take place. The first concerns the empowerment of the disciples by the Holy Spirit. In John, this is not the first that we have heard of the Spirit. In Jesus’ great farewell address to His disciples, He promised that He would never leave them “orphans.” He promised them the Advocate Who would teach and guide them and be His presence in their midst. On the cross, Jesus established a new family, “behold thy son, behold thy mother,” gave “the Spirit” at the moment of His death, and offered the grace of the sacramental life in the gushing forth of the water and the blood from His pierced side. Jesus’ loving care of “His own,” supremely expressed in His death on the cross for His “friends,” continues after the resurrection. The disciples remain confused and afraid even after the electrifying discovery of the empty tomb. Now Jesus calms their fears with His peace and empowers them by the Spirit to do His work in the world. The third encounter is this passage is with us. Jesus turns His gaze to those who will come to faith without having walked with Him in Galilee. The Lord blesses those who come to know Him in word and sacrament, in the experience of communion and in the living out of the Lord’s command to love. Now arises the question of our fears and doubts. Will we be empowered by the Spirit? Will we be moved to faith in the Lord and live by His command? The radical effects of that submission to the Lord are evident in the life of the Christian community described today by the Acts of the Apostles. In the first flush of the gift of God’s Spirit and with the living memory of Jesus’ life, death, and resurrection, the community achieves remarkable unity and charity. They express their witness to the Risen Lord with words and actions as the love of God infuses their relationships with one another. There witness goes beyond words and affects every aspect of their lives, spiritual and concrete. God has given the ultimate gift of love in the life of His Son. Human beings abandoned, betrayed, denied, and crucified His Son. Instead of the judgment and punishment that would justifiably such grave sins, God’s mercy triumphs yet again. The Son has been raised and He brings peace and transformation to this fragile band of frightened followers. He gives the gift of his ongoing presence in the world and empowers them to take part in his ministry of reconciling the world. 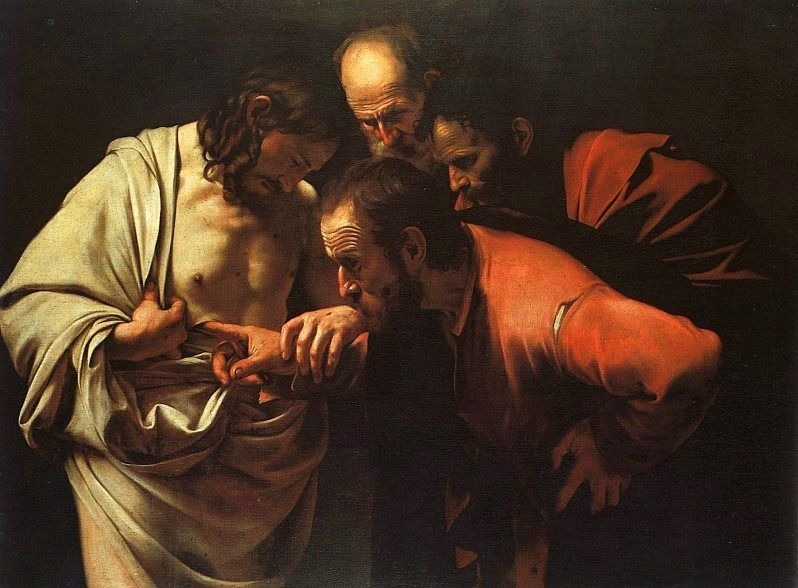 Even “doubting Thomas” finds transformation as he encounters Jesus. And the transformation does not stop with Thomas as Jesus turns to those who will one day come to faith. On this Divine Mercy Sunday, we are invited once again to a relationship that changes everything. With the Lord Jesus in our midst, may we find the grace to move from “crucify Him!” to “my Lord and my God!” And may that submission to the Lord Jesus touch and permeate every aspect of our lives.